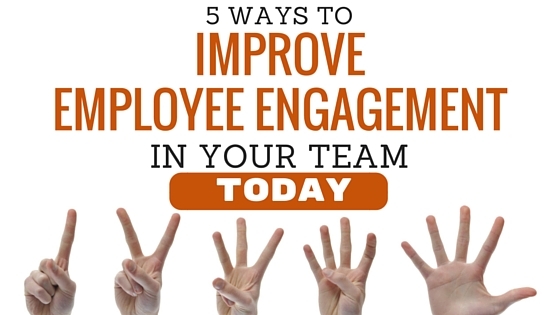 Do you really want to improve employee engagement in your team? Well, the power is in your hands. Don’t sit around and rely on the corporate initiatives. The annual employee engagement survey could be too late. That great team member may have given up and gone. Surveys take months to arrange, complete and review. By the time the results have been discussed and prioritised, the problems have just got worse. And when the improvements are finally implemented, how many of them directly impact your team? Sure, it is great that your company is doing something. But an annual survey – it’s just not enough. Tell me this. If you wanted to feel more engaged in the job you are doing, what would you prefer? A link to a survey every September or a manager who thought about it every day. Whatever your company is doing about improving employee engagement, it is up to you to think about your team. They are your responsibility – and whether they are engaged or not lies with you. As Simon Sinek says in his Ted Talk Why Good Leaders Make You Feel Safe. “You are their leader. You set the tone”. “Great companies have managers who look at engagement as a real-time metric. They pay attention to their direct reports’ behaviors, reactions and interactions. They have a pulse on their teams and are hyper aware of engagement day-to-day”. So do something today. I’m not talking about a formal ‘I’m doing employee engagement’ effort. Just make sure you are talking to your team and, most importantly, listening to their responses. Work shouldn’t be the most important part of anyone’s world. It just shouldn’t. So find out what is in theirs. Let them take the lead on how much detail they share. But if you don’t know a little about their other world, you won’t understand what motivates them. And you won’t know how to help on the occasions those two worlds aren’t in sync. Knowing to give some flexibility just when it’s needed will have an employee paying you back tenfold. Each and every one of your team members knows stuff that you don’t. They see things from a different viewpoint. A great leader not only recognises that but they embrace it. Ask for their input and implement it where you can. You may be driving the bus but someone else may be able to suggest some shortcuts. Another person may notice the flat tyre before you set off. And someone will bring the sandwiches so you don’t have to stop on the way. It gives your team the feeling that you are ‘up to something together’. That they can make a difference. If you have ever been in a team like that, you will understand how great that feels. Give your team a sense of opportunity. They will feel liberated. Perhaps there is something you can delegate to help them grow. Maybe they could swap some tasks with a colleague so they both develop in new areas. One of the biggest reasons people leave a job is that they see no route for them to develop. Be conscious of this. Find ways for them to use the skills they have and develop new ones. There are so many ways to do it to suit the moment. The most important this is to do it. Frequently. And thank for effort, not just success. We have all been in those jobs where it feels like you are putting in herculean effort and still not getting results. Notice those efforts. These may be the most important ‘thankyous’ you give. Employee engagement is not about the annual survey. Yes, if the company takes action based on the results, that makes a difference. But it is mostly about you. And about the environment you build for your team to thrive in. Want more simple ideas on how to improve engagement – read this for 37 other tips!